Overwatch’s competitive season two patch just hit the public test servers, and it’s a doozy. Nerfs, buffs, laughter, tears of delicious, delicious salt—it’s all here. The centerpiece of this PTR patch is, of course, competitive season two. The skill rating system has been overhauled and divided up into tiers, and sudden death is dead, unloved and unmourned. You can read more about that here. Developer Comments: Zenyatta is in a far better place since the last update, but the strength of Orb of Discord has turned him into an almost mandatory pick. These changes reduce Orb of Discord’s effectiveness, but his damage-dealing potential has been increased. The amount of damage that he delivers should feel largely unaffected by the change. D.Va, Hanzo, McCree, Lucio, and Roadhog also received tweaks, albeit less massive ones. 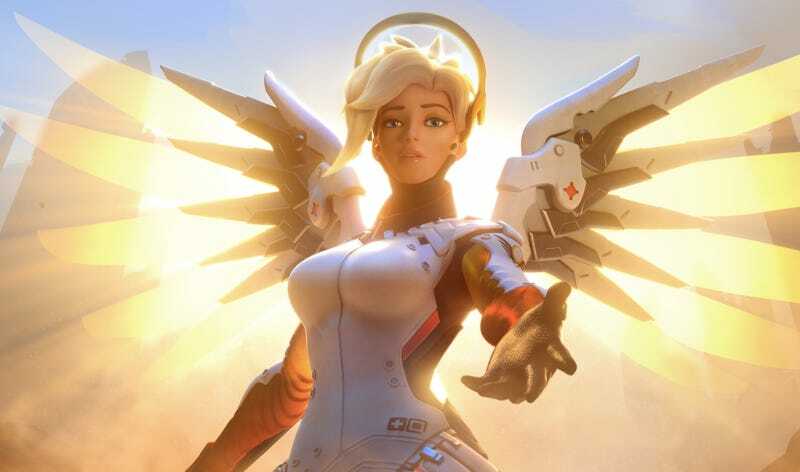 Basically, though, Mei is now significantly more powerful and tactically versatile, Mercy is a goddamn single target healing machine (I wouldn’t be surprised to see this buff reduced a bit before the patch goes live on the main servers), Genji is grounded because he’s been a bad, bad boy (and players couldn’t figure out how to counter him), and Zenyatta’s Orb of Discord isn’t quite as ridiculous as it used to be. I’m mostly glad about these changes—Mei and Mercy have needed buffs for ages—but I worry that the Genji nerf might be going overboard. We’ll see. There’s now an option for all characters to see allies’ health bars. THANK GOODNESS. Watchpoint: Gibraltar’s first checkpoint has been removed. Guess it’s not necessary after some other balance passes. That’ll take some getting used to! Lucio goes less fast now. I understand why (he was basically a mandatory pick), but I’m sad. Now for the usual disclaimer: Blizzard is only testing these elements of the game, and they’re all subject to change. Right now Blizzard’s planning to launch the second season of competitive mode on September 6, but even that’s not set in stone. Regardless, it looks like we’ve got some interesting times ahead. What do you think?